Peter Fonda was never an action hero in the first place. Tall, introverted and sensitive, he was best cast in his breakthrough role, as Captain America, a hippie motorcyclist on an odyssey, in “Easy Rider” (1968). His films since are an undistinguished collection of action and exploitation pictures; the rare good film like “The Hired Hand” (1971) looks lonely in such company. Now, at 57, he has found the role of a lifetime--perhaps the role that points the way to a reborn career. In “Ulee's Gold,” he plays Ulysses Jackson, a beekeeper in the Florida panhandle who has a lot on his mind. He was the only survivor of his Vietnam unit. His wife died six years ago. His son is in prison on a robbery charge, and he is bringing up his two granddaughters as best he can. He is a very lonely man, but he loves his work: “The bees and I have an understanding.” He hasn't spoken to his son Jimmy (Tom Wood) in two years, when one day a call comes. He goes to visit the boy in prison. The son asks for help: His wife, Helen (Christine Dunford), has turned up in bad shape, and is staying with Eddie and Ferris, the two guys Jimmy pulled the robbery with. Jimmy wants Ulee to get Helen and take care of her. “She can just stay gone,” Ulee says. “She's sick, Dad,” says Jimmy. So Ulee drives his pickup truck down to where Ferris and Eddie (Dewey Weber and Steven Flynn) are holed up in a flophouse with Helen, who is strung out on drugs and madness. And he hauls Helen home, although not before the two men tell him they believe Jimmy hid $100,000 from the robbery, and they want it back--or they will come after the grandchildren. A woman named Connie (Patricia Richardson, from TV's “Home Improvement”) lives across the street from Ulee. She's a nurse, divorced twice, no children. The granddaughters like her, and when they see the shape their mother is in, they drag her across the street to help. Helen needs a lot of help. Sedatives, restraints, the whole detox process. Ulee tries to thank Connie. “It's what I do,” she says. The elements are in place here for a fairly standard story in which Ferris and Eddie come looking for the money, and Ulee must defend his family, while falling in love, of course, with Connie--while the girls bond once again with their mother. But to look at events in that way would miss the whole purpose of “Ulee's Gold,” which is not about who prevails, but about what Ulee learns about himself. The movie was written, directed and edited by Victor Nunez, who sets all of his films in Florida and goes from strength to strength. His films include “Gal Young 'Un” (1979), about a backwoods widow's run-in with a con man; “A Flash of Green” (1984), with Ed Harris as a newspaper reporter, in one of his finest roles, and the wonderful “Ruby in Paradise” (1993), with its luminous performance by Ashley Judd. Nunez has a gift for finding the essence, the soul, of his actors; that's why Harris and Judd were so good, and why Peter Fonda here reveals a depth of talent we did not suspect. Nunez is attentive to the quiet in Fonda's nature, to the deeply buried anger, and to the intelligence. There is a situation late in this film that involves a gun, and the Fonda character handles it like a chessmaster, figuring out what the real threat is, and how his opponents will react. Raised on routine movies, we figure Ulee will grab for the gun. Ulee is smarter and deeper than that. The scenes between Fonda and Richardson are charged with quiet tension. Obviously she likes him. He tells her he is no longer good at--well, getting along with people. She understands. What happens between them happens slowly and tactfully. And Nunez is just as careful in the way he introduces Ulee's profession. 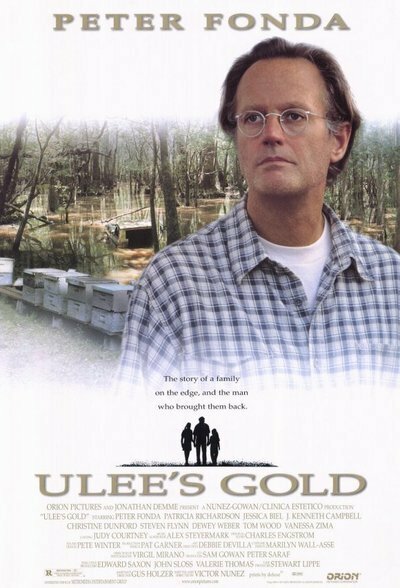 We learn something about bees, and a lot about beekeepers, but “Ulee's Gold” is not a documentary; all of the information is used in the story, especially in a scene where one of the granddaughters uses bees in a parable she tells her mother. Basically, it comes down to: You take care of them, and they'll take care of you.